Agencies, studios and firms that need to keep track of who's working on what and when. 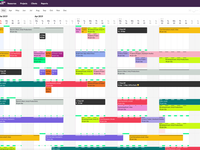 Float schedules teams in more than 150 countries. Resource Managers, Project Managers, Producers and anyone else who needs to schedule resources for projects.